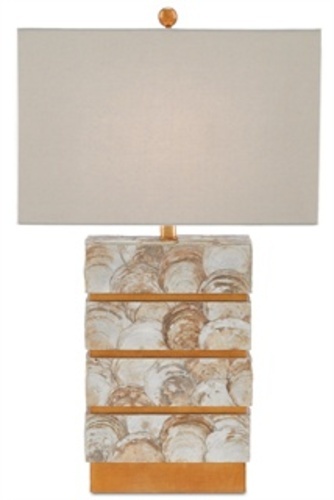 The Smoked Capiz shell that makes up the form of the Cyclades Table Lamp produces an interesting texture. The Dark Gold Leaf accents of the lamp elevate this natural material under a Beige Cotton Shade that measures 18/12 x 18/12 x 11.5. Takes one 150 watt max Edison bulb (not included). Measures: 29.75"H and is made of Capiz Shell & Wood. Ships FedEx ground. All sales final. Not eligible for return or exchange. Please view our return policy for more information.